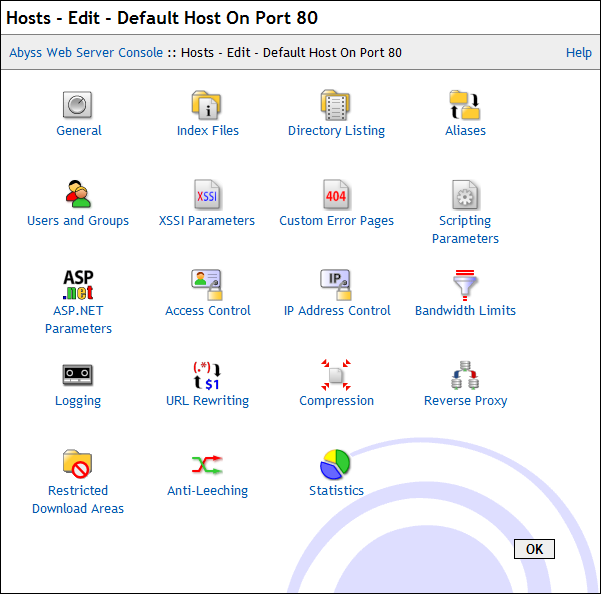 Abyss Web Server X1 is a free Web server available for Windows, Mac OS X/macOS and Linux. Despite its small footprint, it supports secure SSL connections, IPv6, on-the-fly HTTP compression, download resuming, caching negotiation, log rotation, CGI/1.1 scripts, FastCGI, ISAPI extensions, eXtended Server Side Includes (XSSI), ASP.NET (on Windows), reverse proxying, custom error pages, password protection, URL rewriting, IP address control, aliases, custom MIME types, index files, custom directory listings, anti-leeching, and bandwidth throttling. It features also an automatic anti-hacking system and an intuitive multilingual remote Web management interface. With Abyss Web Server X1, hosting your site and your PHP, Perl, Python, ASP, Ruby on Rails, or ASP.NET Web applications is a matter of a few minutes. ISAPI protection filter, protect web site resources by a password. RaidenHTTPD is a Web Server software for Windows. Never Expires. Webserver with integrated webcam. Flash Video Server is a streaming platform for Flash videos and audios. Create WebDB Application with almost only SQL & HTML.